Let’s run a little experiment – who here is an adult, raise your hand…. OK, that’s pretty much everyone. Let’s try another – keep your hand up if you’re also a writer….. right, almost everyone again. Now the kicker – keep your hand up if you have enough time to write. There, see? Pretty much they all went down. And that’s where this little adventure begins. Y’see, here’s the thing – I’m a father of three with a full time job. After the essentials of spending time with the kids, making sure they’re fed, their nappies are changed, their homework is done (different kids, don’t worry), they’re tucked in, all the housework is done, I’m up to date on my current work projects, the house maintenance is under control, and I’ve actually spent some quality time with the wife because, well, being married is nice, I’m pretty much exhausted. And if you’re an adult writer with responsibilities I bet you feel pretty much the same way. I still do get time to write. After a conversation with an editor last month I worked out I’d written over 200k words over the past two years, which isn’t bad, but they were spread over projects. And now I have a novel to deliver and I need the bugger finished. Something, n short, had to be done if I was going to make this work. So, in steps my wife. Like I said, being married is nice. 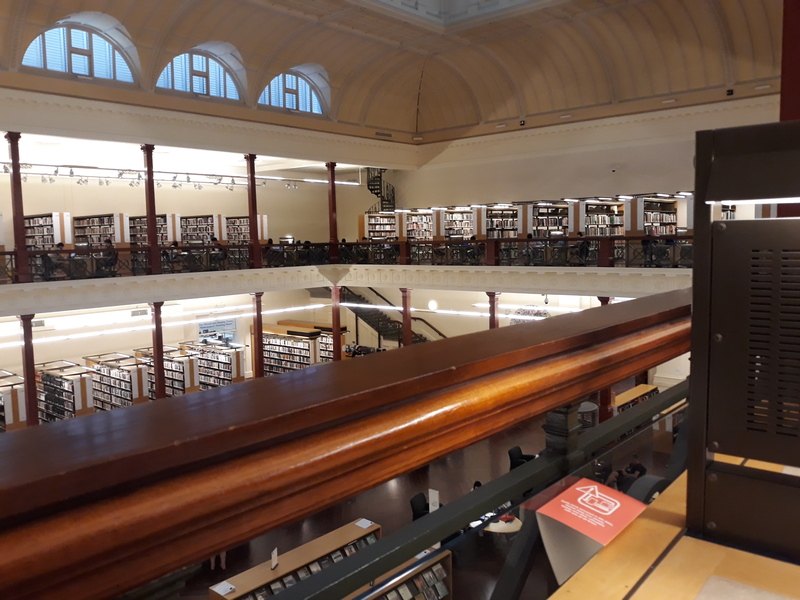 She’s prodded me into action by taking the kids one evening a week, allowing me to stay in the city after work, head to the library (see exhibit A) and get some solid writing in. An actual picture of me not writing but taking a picture…. you get what I’m doing. And the crazy thing is, it worked. I know – actually doing something proactive had positive results – who would have thought? I’ll still be trying to fit what I can in on the train to work when I get a seat (ha!) or at work if I get a lunch break (double ha! ), but for now one evening a week is mine to write and nothing else. Tune in same time next week for further progress. Get These Motherfudgin’ Prams Off This Motherfrikkin’ Hallway!